Festive season is approaching fast and all the weight watchers must have again started worrying about their diet plan. It becomes difficult to maintain a strict diet plan during festive season as many lucrative and calorie rich food items like sweets and deep-fried snacks remain handy. However, there is no need to stress about this condition, as these healthy eating tips for festive seasons are very easy to follow. It is always advisable to have a healthy and low calorie snack at home before leaving for a party. By doing so, you will be able to limit your food intake at party and will also not miss your low calorie, fiber and protein rich diet. A brown bread lettuce sandwich or a serving roti-sabji can be an ideal home platter snack before party. Always try to share the sweets or deep fried starters at buffets. Don’t be greedy and share the gifted chocolates or sweets with other members in the family. You can indulge in all the items presented but mind the portion size. Try to limit the portion size as much as possible. Do not hobble on the tasty treat, rather enjoy every bite slowly. 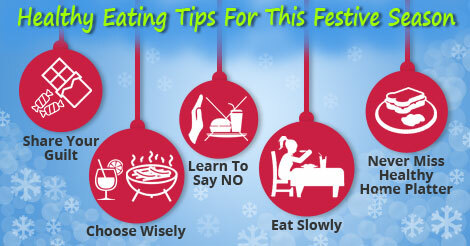 By doing so, you will be able to satisfy your taste buds as well as mind without stuffing too much food. Politely refuse second helping offered by your host and learn to say no. Your health is only yours and you must not feel shy to ward off any thing which is affecting your health and diet. Avoid carbonated drinks and rather select fresh fruit juices. It is advisable to choose grilled food items over deep fried one. Select fruits over sweets or try to make your own dessert by adding fruits and dry fruits to one small serving of sweets.